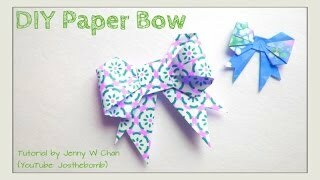 Origami tutorial and video instruction on how to fold the classic and magical origami paper Bow-Ribbon. Origami (折り紙?, from ori meaning "folding", and kami meaning "paper" (kami changes to gami due to rendaku) is the traditional Japanese art of paper folding, which started in the 17th century AD at the latest and was popularized outside of Japan in the mid-1900s. It has since then evolved into a modern art form. Paper cutting and gluing is usually considered kirigami. 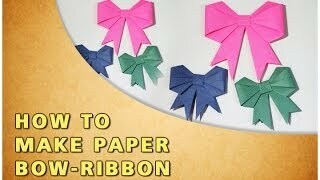 The number of basic origami folds is small, but they can be combined in a variety of ways to make intricate designs. The best known origami model is probably the Japanese paper crane. In general, these designs begin with a square sheet of paper whose sides may be different colors or prints. Traditional Japanese origami, which has been practiced since the Edo era (1603--1867), has often been less strict about these conventions, sometimes cutting the paper or using nonsquare shapes to start with. The principles of origami are also being used in stents, packaging and other engineering structures.